June 1972 introduced to energy work, and worked at it continually, in one form or another to present day. additional info from 1972 - present is in the works. April 2003 - Feb 2004: Attended CLN/Massage Therapy Program and graduated, and also received the Directors Award. October 2003 - Feb 2005: Provided Massage Therapy in the office of Dr. Thomas Gault, DOC on an as needed basis. February 2004 - 2005: Employed by CLN/Massage Therapy Dept prior to Graduating. Various positions included assisting instructors and providing coverage as the Night Supervisor of their student wellness clinic. Summer 2004 & ongoing: Various Family reunions, providing Chair Massage, Reiki, and other Healing Arts. August 2004 - present: Moved into and still practice in an office within 15 minutes of Harrisburg, Mechanicsburg, Lewisberry, Dillsburg, Lemoyne, Camp Hill and more. October 2004 & as needed: Assisted Susan Halowchek at National Horse Show in the Farm Show Complex, Harrisburg, PA.
Fall 2004: Assisted in providing participants in the Lupus walk by performing sports massage before and after the event. 2004: Attended the Hogs for Dogs Rally at Susquehanna Valley Harley Davidson at 6300 Allentown Blvd, Rt 22 in Harrisburg, PA providing Chair Massage. 2004: Helped with the Diabetes Walk at City Island Performing Sports massage for participating atheletes. Summer 2005 & ongoing: Various Family Reunions providing Chair Massage and additional Healing Arts. July 2005: Became a Reiki II practitioner by Wife and Reiki Master Denise Turbett. August 2005: Lisburn Community Fireman's Festival, providing Chair Massage. October 21st, 2005: Invited by a great local rock band called "Condition K" to attend a birthday party hosted by the band at Gulifty's/Zees in New Cumberland, PA. 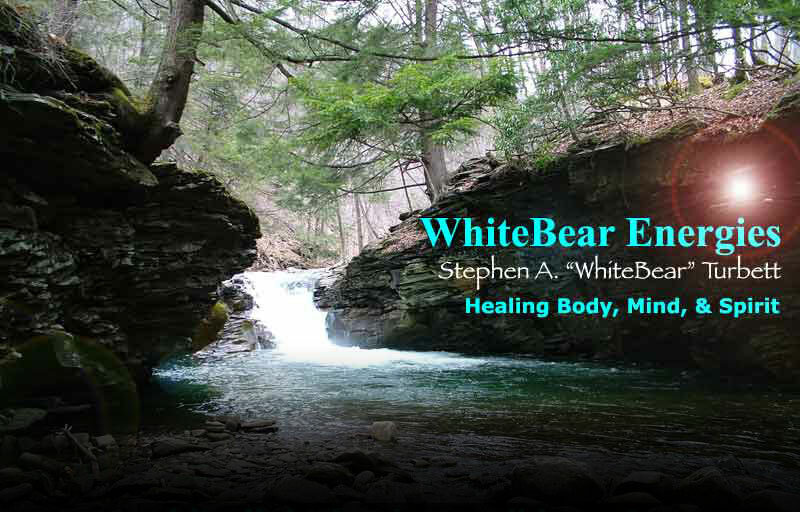 Soul Readings by WhiteBear were provided throughout the evening. Thanks to "Condition K" for a memorable evening! October 2005: Attended the Cumberland County "Bee Fit" Health Fair and provided Chair Massage for Cumberland County Employees. December 2005: Provided chair massage for numerous company, private, and Christmas parties. December 25th, 2005: Became Reiki Master. March 16th, 2006: provided information on relaxation techniques during the PAWS General Meeting in Camp Hill, PA.
March 31st - April 1st 2006: 1st American Business Women's Association Regional convention providing chair massage. Summer 2006 & ongoing: Various Family Reunions providing Chair Massage and additional Healing Arts. August 2006: Lisburn Community Fireman's Festival, providing Chair Massage. December 2006: Provided chair massage for numerous company, private, and Christmas parties. Summer 2007 & ongoing: Various Family Reunions providing Chair Massage and additional Healing Arts. August 2007: Lisburn Community Fireman's Festival, providing Chair Massage. December 2007: Provided chair massage for numerous company, private, and Christmas parties.